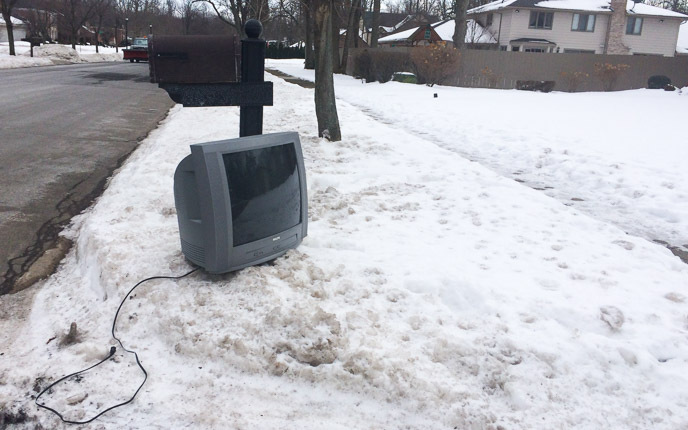 UPDATE: As of February 2016, television sets are no longer accepted for drop-off at the Amherst Highway Department location. If you have an old TV you’d like to dispose of, call the Highway Department at (716) 631-7117 to schedule a pickup at your house. Typically they will pick up your old TV curbside on your regular garbage day during the last week of a given month. Discarded television sits at curb waiting to be picked up with the rest of trash. E-waste must be disposed of using environmentally safe methods. Where Town of Amherst residents can drop off their e-waste — for free.